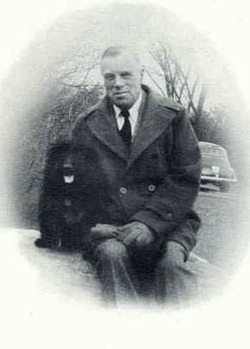 James L. Goodwin (1881-1967) was one of the state's earliest conservationists. He attended the Yale School of Forestry and, a few years after graduating, came to Hampton, CT where he purchased his first 28 acres of land. "It was my ambition to own, develop, and operate my own timber acres according to the best forestry principles." He expanded and improved his forest lands until he ultimately owned 2,000 acres which included Christmas trees, timber stands and apple orchards. In 1933, he built a dam on Cedar Swamp Brook which created the 135 acre Pine Acres Pond. Philip Goodwin, James's brother and acclaimed architect, turned the farmhouse into a home where Goodwin would vacation and his caretaker would live. In 1964, James L. Goodwin made a generous donation of this property to the state of Connecticut and its people . The house at 23 Potter Road in Hampton is now the Goodwin Conservation Education Center where the staff and the Friends of Goodwin try to carry out the mission of educating the public about "general, wildlife and forest conservation." We have a wide range of activities for everyone at the Goodwin Center. Visitors can hike, horseback ride, mountain bike, cross country ski or snowshoe on the well maintained trails. They can also find a native plant arboretum showcasing indigenous plants and demonstrating their cultural significance. When the Conservation Center is open, the public can take a self guided tour of the pictorial history of the Goodwin Forest as well as visit the natural history displays in the Center's classroom.